I wasn't planning to write this post. I figured that I had made it to 6 months, I had things down. Everly was getting enough from me, we knew how to latch, and all that Jazz. I was a breastfeeding pro! So here we are at 9 months. 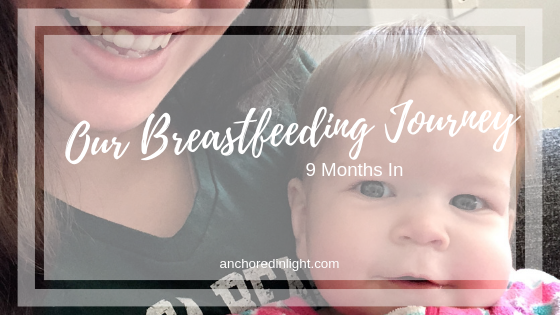 9 months of breastfeeding and it has been so different than what I thought it would be. First, the switch to solids. Everly took to solids like a duck to water. She eats and she eats a LOT! It seemed like a lot, but it wasn't until my mom looked into it that I realized that she was eating a lot more than other babies her age. But, I didn't worry too much about it. Everly started sleeping through the night (I credit that partially to solids and partially to sleep training and partially to Everly for just being an awesome baby.). When we switched to solids I just nursed her before I fed her and went along as normal, because she was going down at 6:30, I would pump once for the milk for her bottle before bed and called it good. And that worked for a while. Until I realized that I wasn't pumping out very much. I decided to get more dedicated to pumping. I would pump twice after she went down. I would pump between feedings. I remembered from when Everly was a newborn that 8 times was the magic number. So I tried to hit that number, between pumping and nursing I was hitting 8 times. Nothing seemed to be changing. So I started pumping after every nursing session. Admittedly, nursing has gotten shorter and shorter as Everly has gotten older. I just assumed that it was because Everly was a more efficient nurser. I didn't ever think that it could be because I was making less milk. When she was down to 3 minutes or less a side I was concerned, but not overly so because if I pumped after I still didn't get anything. I drank more water. I ate 4 lactation cookies every day. I pumped and pumped and prayed. Everly got teeth and started biting me. I thought that maybe this was my sign to start pumping exclusively. I thought that I'd get more milk because I'd be pumping for 15 minutes every time, and I wouldn't get bitten. I tried that for a day or two. I read articles about babies self-weaning that assured me that babies do not self-wean before a year. It was probably a phase that I could choose to work through or not. I chose to continue to work through it. Through all of this I knew that Everly hasn't been gaining weight (although she did seem to be getting taller). I got more and more depressed about it all. I wanted to be a good mom. Good moms feed their babies only breastmilk for a year. That's what I'd been told over and over and over. It got to the point where I considered using formula to supplement and my sweet husband put it on the list to get at the store. Then he saw the cost and decided to hold off. I felt like I'd failed. I felt like if I didn't succeed, my baby would suffer and I would be costing us all this money. I fell into a deep hole of depression where I seriously didn't want to do anything. I had been working out by running three times a week and doing yoga three times a week, but I couldn't get myself to do yoga for more than a few minutes. All I wanted to do was curl up in a ball and stare at the wall. And that's about all that I did when my baby was sleeping. Besides pumping that is. 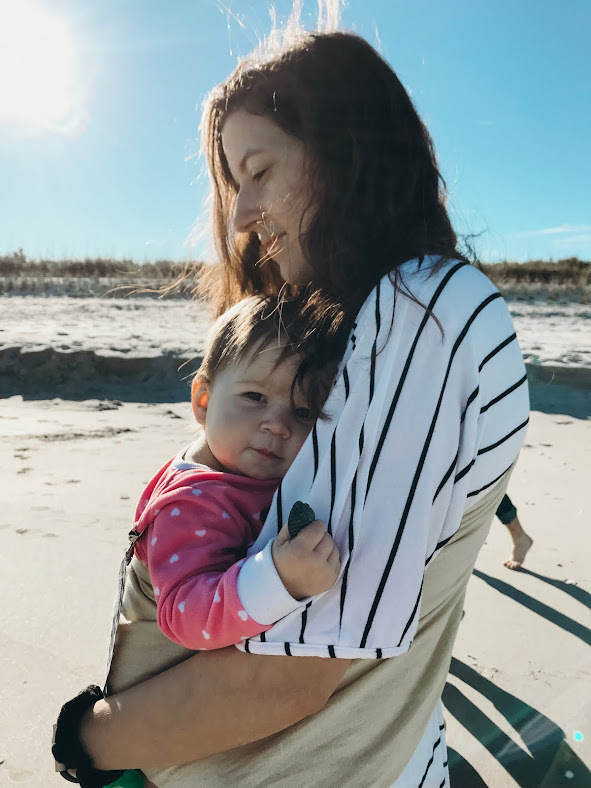 I wanted to make it to Everly's 9-month appointment so that I could talk to the doctor about it (honestly I think that Pediatrician appointments for your first baby are spaced WAY too far apart.) I wanted to make it to her 9-month mark so that I could say that at least I had made it to 9 months. I did not make it to 9 months. I knew that I was making about 10 ounces a day. I knew that Everly needed 16-24 ounces a day. So finally I told my husband to buy the formula anyway. I mentally prepared myself to feel worse than I had in the weeks leading up to this decision (which, by the way, I thought about constantly and made the decision about 10 times before we actually followed through). Miraculously, once that formula was here I felt so much better. I still planned to nurse so I knew that she'd be getting antibodies from me, but the pressure to be her sole provider of milk was gone. I didn't freak out when I pumped out just under an ounce every time I pumped. I knew that Everly would get what she needed. So we are currently on day two of formula. I have to nurse Everly in dark quiet rooms now because otherwise I can't get her to stay latched long enough to get a single let down (we had to start doing that before the formula as well). But we are still nursing. I wish that I could go back and tell myself that formula wasn't so bad. I wish I could go back and tell myself that even if I hadn't tried so hard to up my supply, that it would still be ok to choose to supplement with formula. I wish I could tell myself that fed is best, and really believe it.